New Brunswick-based Master Promotions Ltd. has acquired the highly successful British Columbia trade event Resources Expo, previously known as the Forestry and Resources Expo, which is held in Prince George, British Columbia. This event has been organized by the Resources Society and Central Interior Logging Association (CILA) for many years and this group will still be a driving force behind the event. Master Promotions Ltd., with its many years of experience with forestry, heavy equipment and construction shows, plans to grow this event, which will now be known as the Canada North Resources Expo, presented by the CILA. This revamped event will take place on May 31-June 1, 2013 at the CN Centre in Prince George. “We are so pleased to partner with Master Promotions, and to see the expansion of our show. It has been part of our strategic plan for years, as the North diversifies and we take advantage of the world’s demand for our resources,” says MaryAnne Arcand, Chair of Resources Expo, and Executive Director of the CILA. Keith Peacock, vice-president of operations and sales with Master Promotions, says this event meshes perfectly with the company’s current portfolio of heavy equipment, construction, forestry, commercial fisheries and trucking shows that it currently owns or manages across the country, and solidifies its presence in Western Canada. Bill Tice has joined HewSaw Machines Inc. in a capital sales role and as marketing manager. 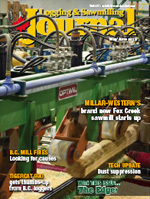 Tice was previously the editor of Canadian Wood Products and Canadian Forest Industries magazines. 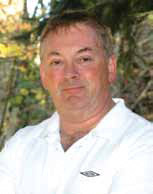 He has worked in the forest industry for 25 years, during which time he has held marketing and communications positions with Canadian Forest Products (Canfor) and West Fraser Timber. Pratt & Whitney Power Systems has been awarded a contract to deliver a 13 megawatt (MW) biomass heat recovery power plant for West Fraser Timber in Chetwynd, British Columbia. The state-of-the-art power plant will provide clean, carbon-neutral power to the company’s Chetwynd Forest Industries plant, using two Turboden 65 HRS Organic Rankine Cycle (ORC) turbo generators. Turboden is a Pratt & Whitney Power Systems company. Organic Rankine Cycle technology uses heat from several sources including biomass, geothermal, concentrated solar power, and by recovering heat from industrial processes, engines and gas turbines. The technology is unique in that it uses an organic fluid instead of steam to drive a turbo-generator, which can range in nominal output from about 1 to 10 MWs and up for a single ORC module. The two ORC units for Chetwynd Forest Industries facility will maximize the electrical output, while each providing the lumber plant with 6.5 MWs of renewable electrical power at max load. Canadian loggers got their first glimpse of the new Southstar harvester/processor head at the ILA in May. The Tristar 585 is a high production head and the first in the family of Southstar processors to reach Canada. It is designed for 25-ton carriers and a steady diet of stems up to 23” cutting dia. This New Zealand built, three-roller head comes equipped with a 3/4” pitch main saw and a .404 topping saw. Weighing in at 6,285 lbs., some of the 585’s key benefits include a wide, high tensile steel frame, an internally routed four-hose system, a recessed “find end” photo cell, replaceable delimbing knife cutting edge inserts and a choice of computer control systems. Shortly after the ILA convention ended, a Vernon based logger put the first two Canadian Southstar heads to work. Waratah Forestry Attachments and its supplier, Auckland, New Zealand-based Actronic Technologies, have co-developed for many years the LogRite measuring and control systems. The companies have now agreed that Waratah will handle the LogRite system exclusively, and Actronic will continue to focus on its other product lines, businesses, and new opportunities. Going forward, Waratah will be the exclusive owner of the LogRite system, and has applied for trademarks for this brand in multiple countries. Waratah will continue supporting LogRite systems through its dealers and distribution centers worldwide to service its customer base. The Morbark 40/36 whole tree chipper is a compact, affordable, productive drum chipper designed with the biomass industry in mind. Equipped with the same internal drive perfected on Morbark horizontal grinders, along with an extra wide feed opening, the Model 40/36 aggressively feeds brushy tops and limbs, quickly and effortlessly filling a chip van to maximum legal load capacity. The feed system is more efficient due to a staggered knife configuration and contains fewer moving parts, reducing maintenance. The 40/36 comes equipped with the Morbark Integrated Control System, allowing for diagnostic monitoring both onsite and remotely. This heavy-duty chipper is also easily moveable in the woods and requires no extra permits for transport. New to the North American market, the Hitachi ZX180LC-5 excavator is said to pack excellent productivity and fuel economy into a small package. 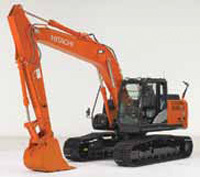 The ZX180LC-5 is slightly bigger than the new 160LC-5, yet has a unique boom/arm configuration for greater lift capacity and a wider undercarriage for more stability. It is lighter and easier to transport than the next sized up 210-5/210LC-5 excavators, yet can perform much of the same work while saving diesel fuel cost. It can come equipped with either a 2.71 m. or 3.21 m. arm; 3910 kg counterweight; and 600, 700, or 800 mm triple semi-grouser shoes. Three work modes allow the operator to choose a digging style that fits the job. High Productivity (HP) delivers more power and faster hydraulic response. Power (P) delivers a balance of power, speed, and fuel economy for normal operation. Economy (E) maximizes fuel efficiency while delivering an enhanced level of productivity.